DOCUMENT STAND features two 20"W x 13"H panels; a document display board with two clips above an inclined writing surface. Writing surface includes two clips and hinged, clear document protector. Heavy-duty steel stand has three glides. Writing surface is 38" high. Overall height 61". Panels are yellow high impact polystyrene. Also available as wall mounted unit. Two larger models also available. 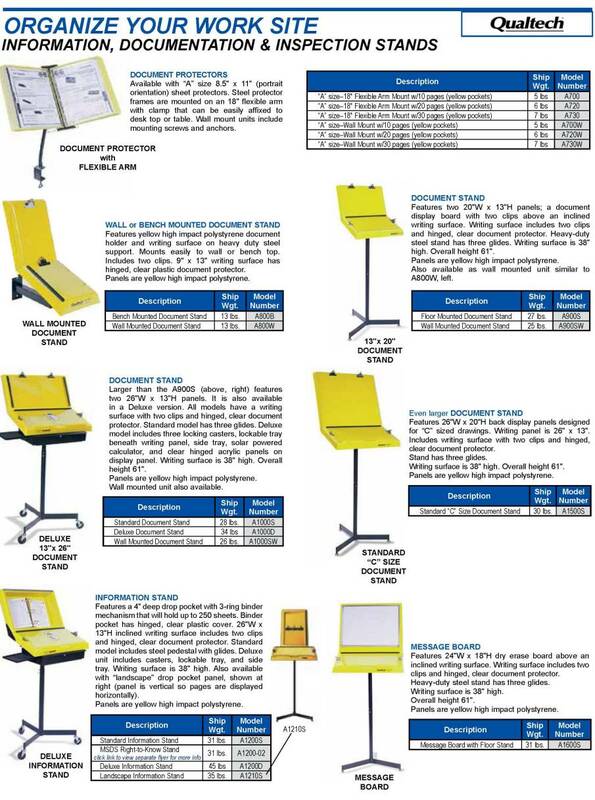 CATALOG DISPLAY STAND makes an ideal reference center for product catalogs, specification sheets or repair manuals. Angled lower panel has twelve 1" three ring binder sections. Back 13" x 26" display panel includes two clips. Sturdy steel stand has dual columns and four feet with glides. Panels are yellow high-impact polystyrene. BLUEPRINT DISPLAY STAND plus WRITING SURFACE features 36"W x 26"H display panel with three clips for "D" size prints. Inclined writing surface includes two clips and hinged and clear document protector. Standard model has four glides on steel stand. Deluxe model also includes four casters, locking tray, side tray, solar powered calculator and clear acrylic cover hinged to back panel. Panels are yellow high impact polystyrene. INFORMATION STAND features a 4" deep drop pocket with 3-ring binder mechanism that will hold up to 250 sheets. Binder pocket has hinged, clear plastic cover. 26"W x 13"H inclined writing surface includes two clips and hinged, clear document protector. Standard model includes steel pedestal with glides. Writing surface is 38" high. Deluxe unit includes casters, locking tray and side tray. Also available with "landscape" drop pocket panel (panel is vertical so pages are displayed horizontally). Panels are yellow high impact polystyrene. INSPECTION STAND features recessed 9" x 12" cushioned parts tray and 12" x 12" writing surface plus a 13" x 26" back display panel with two clips. Panels are yellow high impact polystyrene. Non-adjustable stand has three glides. Writing surface is 38" high. MESSAGE BOARD features 24"W x 18"H dry erase board above an inclined writing surface. Writing surface includes two clips and hinged, clear document protector. Heavy-duty steel stand has three glides. Writing surface is 38" high. Overall height 61". Panels are yellow high impact polystyrene. 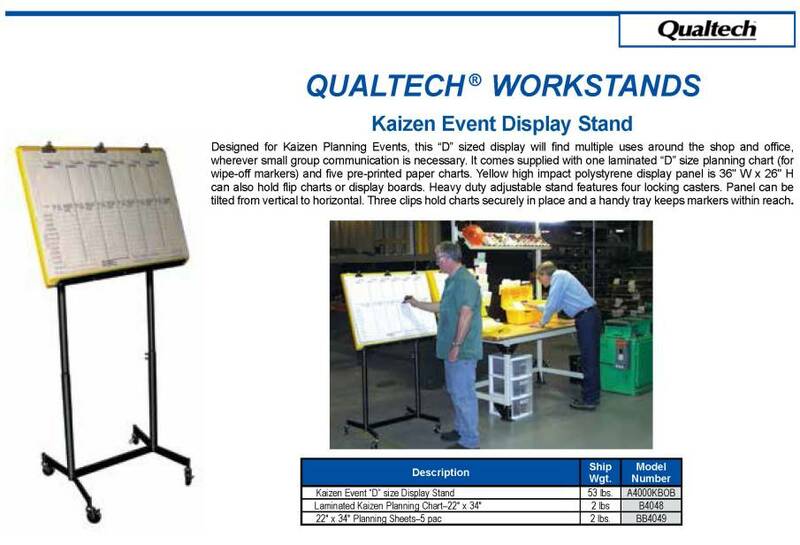 Designed for Kaizen Planning Events, this "D" sized display will find multiple uses around the shop and office, wherever small group communication is necessary. It comes supplied with one laminated "D" size planning chart (for wipe-off markers) and five preprinted paper charts. 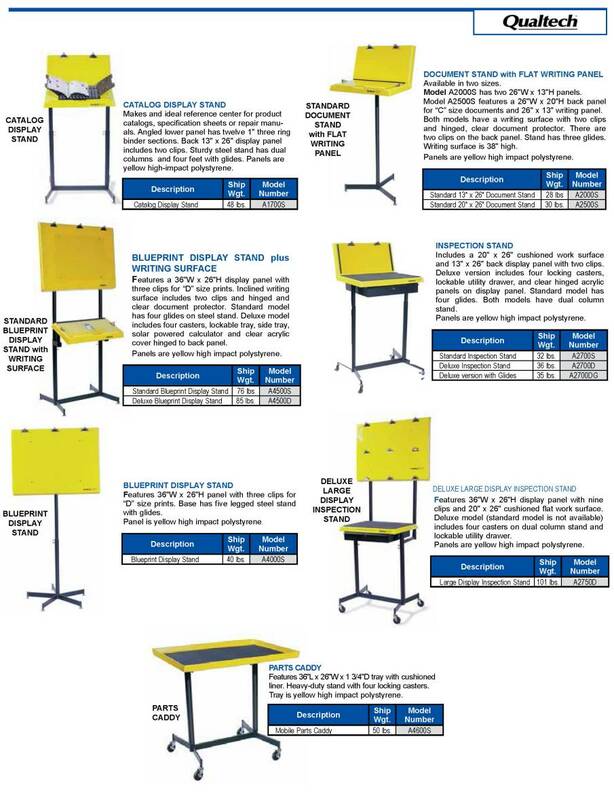 Yellow high impact polystyrene display panel is 36"W x 26"H can also hold flip charts or display boards. Heavy duty stand features four locking casters. Panel can be tilted from vertical to horizontal. Three clips hold charts securely in place and a handy tray keeps markers within reach. PARTS CADDY features 36"W x 26"H x 1 3/4"D tray with cushioned liner. Heavy-duty stand with four locking casters.